Alissa Llort, a junior advertising student on the Strategic Brand Management track, was this year’s recipient of the 2018 Irene Runnels – Paula McStay Scholarship and the AAF-Tenth District Scholarship. 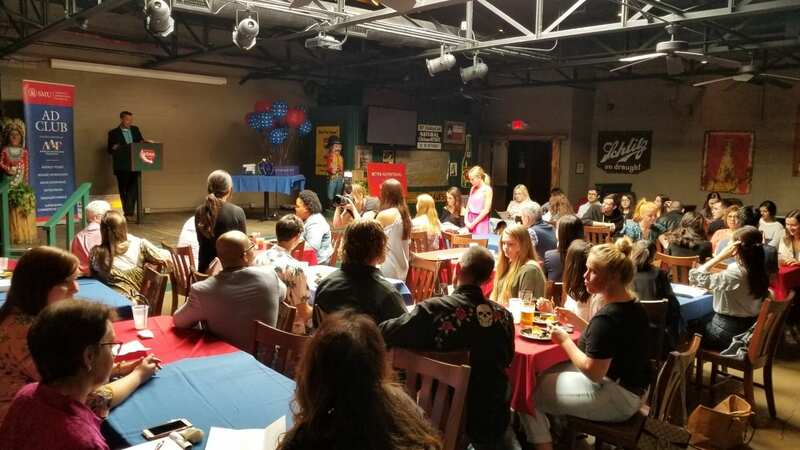 On April 5, 2018, the Dallas Area Alliance for Women in Media Foundation, Inc. awarded scholarships in the names of Irene Runnels, a distinguished and respected Dallas broadcaster and Paula McStay, a former Fort Worth advertising executive. 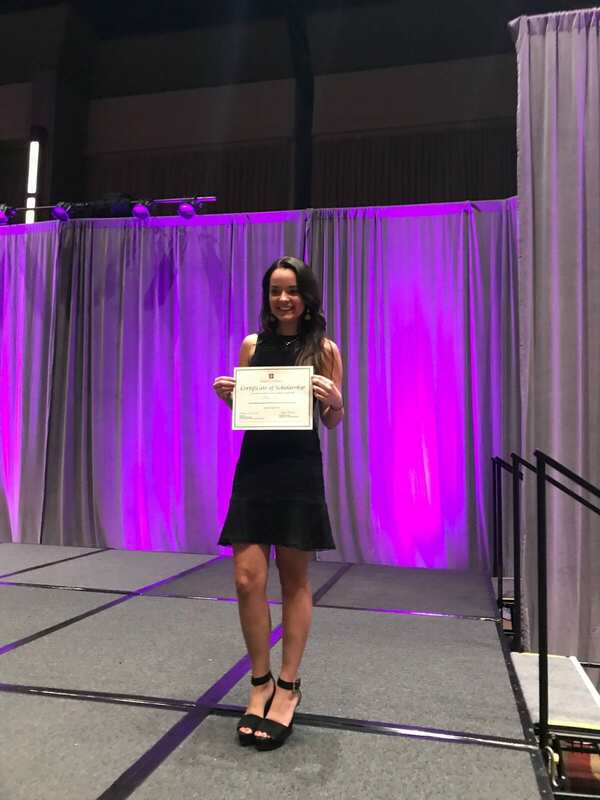 Alissa was honored for her accomplishment at the Dallas Area Alliance for Women in Media Foundation Award of Excellence Gala. 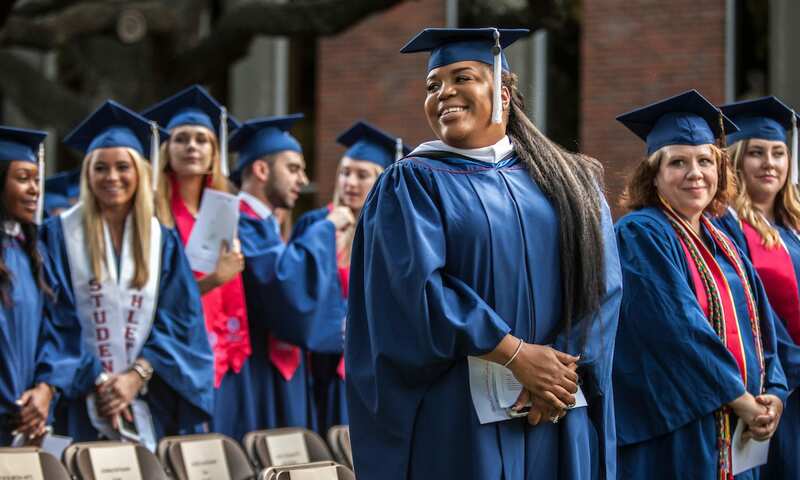 Applicants were considered on the basis of educational and career goals in their major field of study, activities and honors, service to community and references. Alissa at the Dallas Area Alliance for Women in Media Foundation Award of Excellence Gala. Alissa feels that Irene Runnels and Paula McStay have truly paved the way for the next generation of women to chase their professional advertising dreams. Alissa’s personal goal is to continue to empower young female leaders based on her college experiences. “I feel proud to have received an award from an organization that supports successful women in the media industry, because when we support each other, we are unstoppable!,” she said. 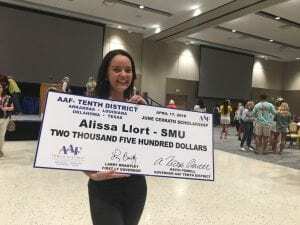 Alissa is currently the marketing director at the Women Ambassadors Forum, a student run non-profit organization that aims to empower women globally through an annual forum held at SMU. In this principal role she leads her team in branding, graphic design, PR, social media and marketing. 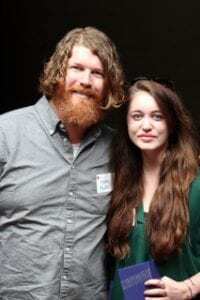 A few days later, on April 15, 2018, Alissa was selected to receive the AAF (American Advertising Federation) Tenth District Scholarship, and was honored at the Tenth District Annual Convention in Corpus Christi, Texas during the NSAC (National Student Advertising Competition), Student Reception. AAF District 10 endorses $2,500 scholarships which are designed to recognize, promote and encourage academically talented students in advertising-related disciplines, helping them to complete their education. 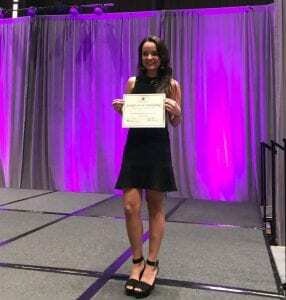 Alissa was one of only three students selected to receive this award, competing against applicants from four states, including Arkansas, Louisiana, Oklahoma, and Texas. Tenth District Annual Convention in Corpus Christi, Texas during the NSAC. 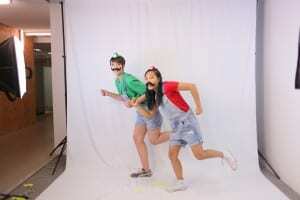 According to Alissa, TAI has inspired her to be a professional advertiser even before graduating. “My advertising classes and professors have been key into my growth throughout these two years,” she said. Please join the Temerlin Advertising Institute in congratulating Alissa on her outstanding achievements. 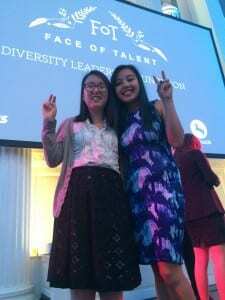 TAI is thrilled to have Alissa’s talents recognized with these prestigious scholarships. 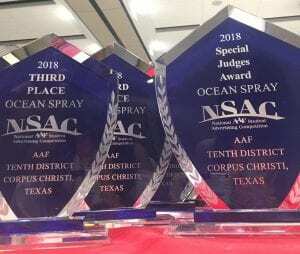 The 2018 SMU-TAI’s Ad Team, led by advisor Professor Amber Benson, competed with universities from Texas, Oklahoma, Arkansas and Louisiana, in the AAF District 10 Convention, ADVENTION, in Corpus Christi, Texas on April 15, 2018. They placed third overall and took home a Special Judges Award for Best Market Segmentation in this year’s National Student Advertising Competition. 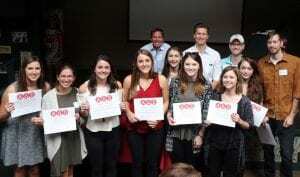 Additionally, TAI students Avery Lewis and Alissa Llort were awarded AAF Tenth District Scholarships. All-in-all a great weekend! TAI student Harrison Fiveash said he could have not been more excited with the outcome in Corpus Christi. 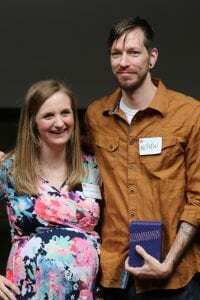 “Not only placing third, but receiving the Special Judges Award for Best Market Segmentation is a true testament to how hard and cohesively our team operated,” he said. Ad Team members had been working hard since the beginning of the Spring 2018 semester when they began doing research and strategy development for Ocean Spray, this year’s national client. The challenge was to drive relevancy of the brand for older millennials across both food and beverages. 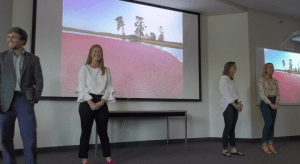 With the concept BREAK OUT OF THE BOG, the team created a memorable campaign designed to give older millennials, aged 25-34, new reasons to purchase Ocean Spray throughout the year, by leveraging the health benefits, and highlighting Ocean Spray’s responsibility to the environment and to their farmers. The team was asked to target older millennials, but they broke it down a little further to reveal a sweet spot in the millennial market that would provide Ocean Spray the highest lifetime customer value. How? by introducing the HENRYs. A HENRY is a “High Earner that is Not Rich Yet.” They view the brands they buy as a reflection of themselves, and improve their personal brand equity by buying from brands that they have a positive relationship with. 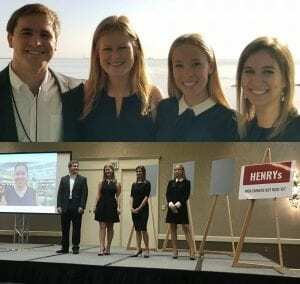 Since HENRYs are both early adopters and social influencers, investing in them would create a halo effect that would influence the rest of the 44 million older millennial target. 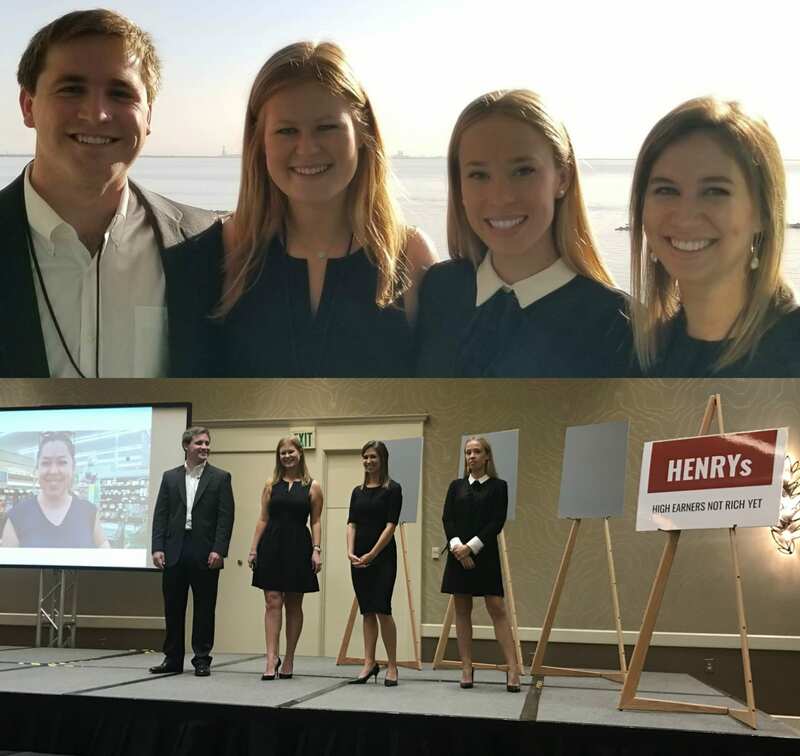 After harvesting research insights, the team came to the conclusion that when it comes to the HENRYs, the brand is bogged down. These millennials tend to buy Ocean Spray products during the fall-winter holiday season, are unaware of Ocean Spray’s extensive product line, are skeptical about health claims, and don’t know about all the amazing things Ocean Spray does as a company. The team decided to build on the existing brand equity of Ocean Spray’s highly popular “Straight from the Bog” campaign by breaking the Bog Guys, Justin and Henry, out of the bog and placing them in scenarios which align with the interests and values of the target market. All they needed to do, was to BREAK OUT OF THE BOG. Four team members, Amy Cooley, Harrison Fiveash, Alex Mackillop and Sara Jane Stephens presented the team’s work to a panel of industry judges at the competition, with the goal of leveraging Ocean Spray’s social responsibility and their healthier and celebration-worthy products; showing that Ocean Spray could become more than just a Thanksgiving staple, a sugar-filled juice cocktail, and another corporate name. Presenting Team: Harrison, Sara Jane, Alex and Amy. Advertising majors are required to complete ADV 4399 Advertising Campaigns as part of their curriculum. This class combines major advertising theories with practice, allowing students to develop and present an advertising campaign to a real client based on current advertising challenges that the client is facing. 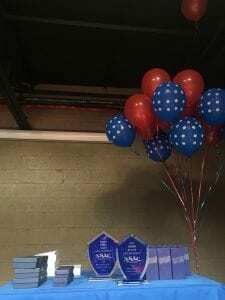 Students that take Advertising Campaigns during the Spring semester have the opportunity to participate in the National Student Advertising Competition (NSAC). Recent NSAC clients include Tai Pei Frozen Foods (2017) Snapple (2016) Pizza Hut (2015) Mary Kay (2014) Glidden Paint (2013) and Nissan (2012). 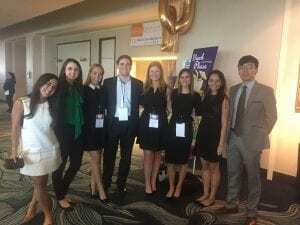 Ad Team Members in Corpus Christi, TX: Rita de Obarrio, Anne-Marie Geisler, Alex Mackillop, Harrison Fiveash, Sara Jane Stephens, Amy Cooley, Alissa Llort and Frank Zhang. 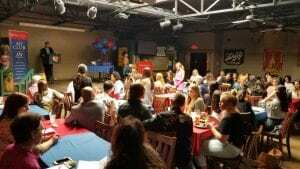 TAI Students and Faculty at the Awards Presentation in Corpus Christi, TX. Please join the Temerlin Advertising Institute in congratulating this year’s SMU-TAI’s NSAC team on their outstanding work and accomplishments! Members of the 2018 SMU-TAI’s NSAC team are: Hayley Banas, Myla Borden, Mary Charles Byers, Amy Cooley, Rita de Obarrio, Harrison Fiveash, Anne-Marie Geisler, Conrad Li, Alissa Llort, Alex Mackillop, London Mercer, Shelby Pointer, Juan Reyes, Sara Jane Stephens, Sara Ann Whiteley and Frank Zhang. 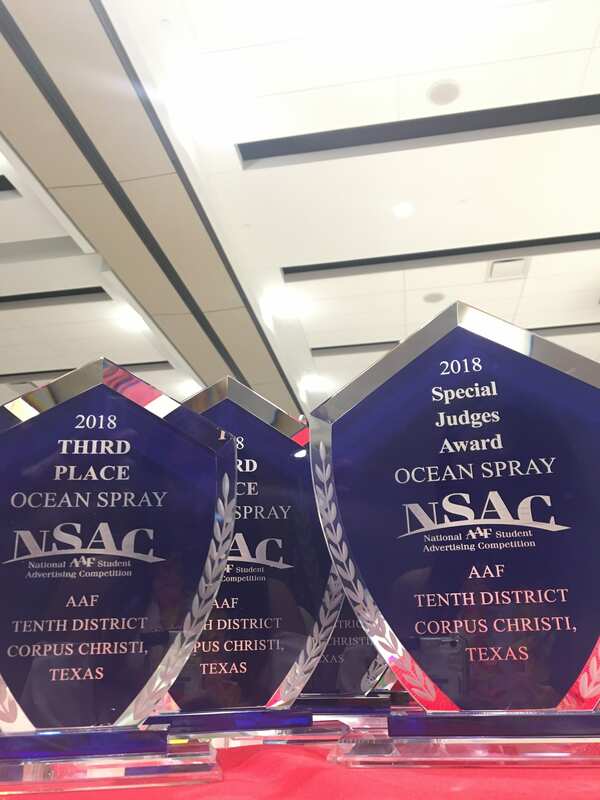 Now that the campaign for Ocean Spray has been created, SMU-TAI’s Ad Team has begun to get their final presentation ready for the AAF District 10 competition in Corpus Christi, TX. 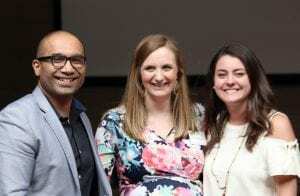 The members that were selected to present the team’s work to a panel of judges shared their expectations for the National Student Advertising Competition (NSAC). Amy Cooley– Advertising major on the Strategic Brand Management and Spanish major. Alex MacKillop – Advertising major on the Strategic Brand Management track with minors in Business and International Studies. Harrison Fiveash – Advertising major on the Strategic Brand Management track with minors in Communications and Arts Entrepreneurship. Sara Jane Stephens – Advertising major on the Strategic Brand Management track with a minor in Spanish. SMU-TAI’s Presenting Team: Harrison, Sara Jane, Amy and Alex. The team will present their integrated campaign at the AAF District 10 Convention, ADVENTION, on April 15, in Corpus Christi, Texas. The winning team(s) from each district will advance to the 2018 semi-finals, which will take place over two days, on May 2–3, 2018. Between 16 and 20 teams will compete for one of eight spots in the finals. Eight finalists will then compete for the national title at the annual ADMERICA conference, which will take place in Chicago, Illinois in early June. TAI is confident in Ad Team’s effort, abilities and talent. We wish them the best of luck at the NSAC district competition this weekend! For more information about NSAC please visit the competition website. 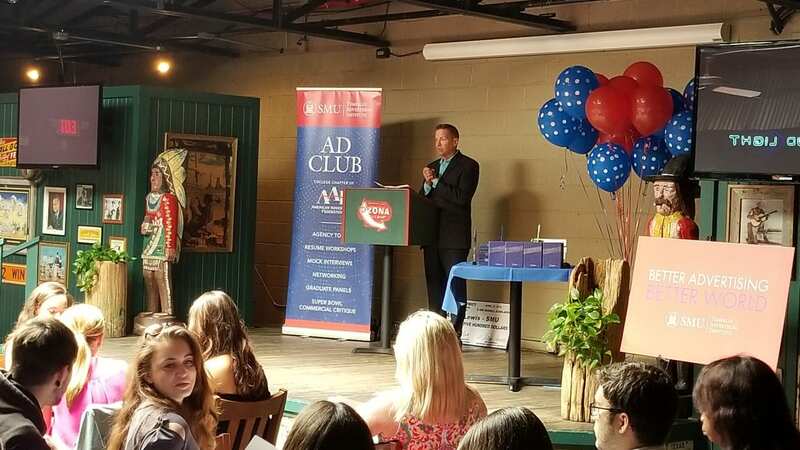 Tuesday June 13, Temerlin Advertising Institute attended AAF Dallas’ Shining Stars Award Luncheon as the presenting sponsor of the event. 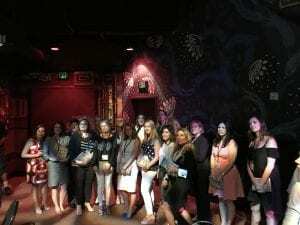 The event honored twenty women in the Dallas advertising industry who have incredible ambition, work ethic, creativity, and leadership. TAI was proud to be the presenting sponsor of this inaugural event and honor these extraordinary women in our local industry. 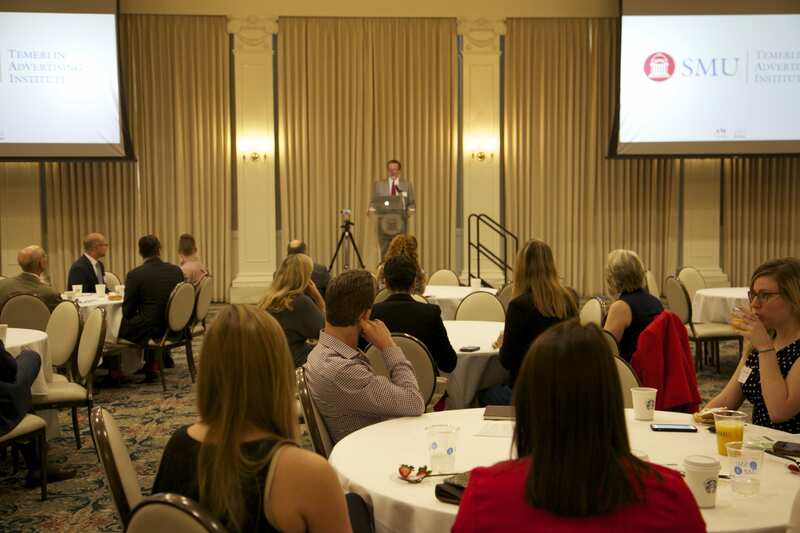 The event was just one of many partnerships that Temerlin Advertising Institute is a part of in the Dallas area. Click here to view this year’s Shining Star Recipients. Speaker Clark Rector at the podium. 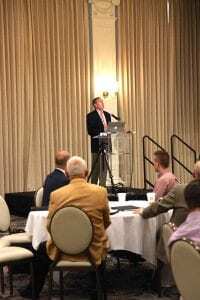 As the EVP Government Affairs for AAF, Rector is in charge of the grassroots lobbying efforts of the AAF and its’ members. They have been successful in defeating ad tax proposals and other threats to the advertising industry in Congress. 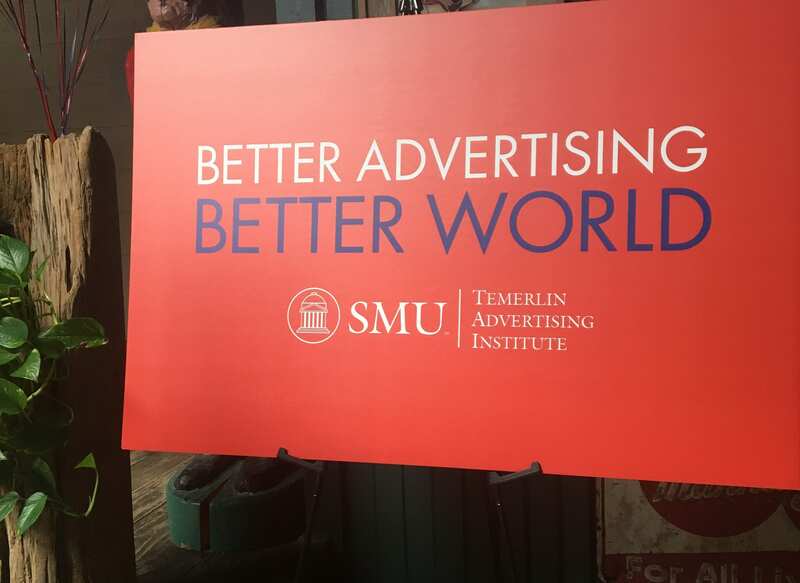 Many industry professionals, including various TAI professors, made their way to the SMU campus to hear Rector speak about the effects of politics on the advertising industry and what the advertising community can do to get involved. 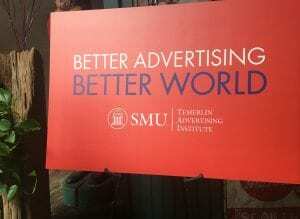 Attendees in the Martha Mack Proctor Ballroom at SMU. 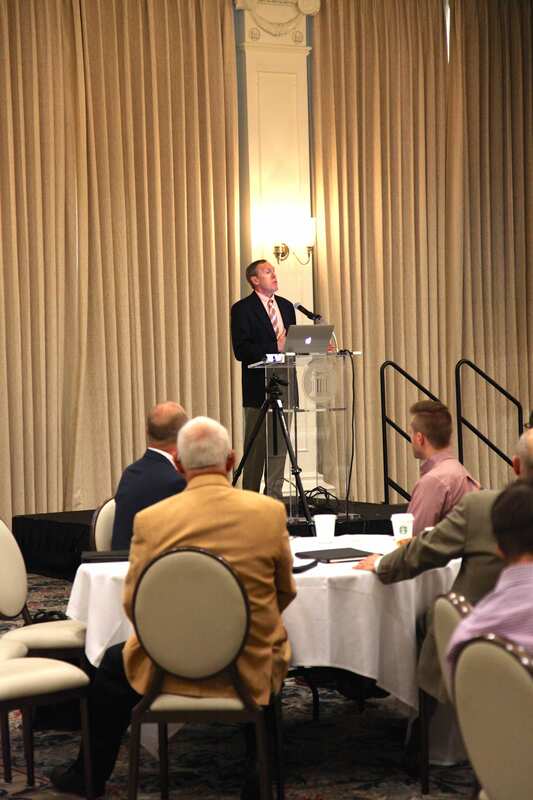 TAI is passionate about staying informed on all current topics in the advertising industry, hosting guest speakers periodically throughout the year. 2016 Exxon Mobil Lecture Announced for Thursday, April 21st. 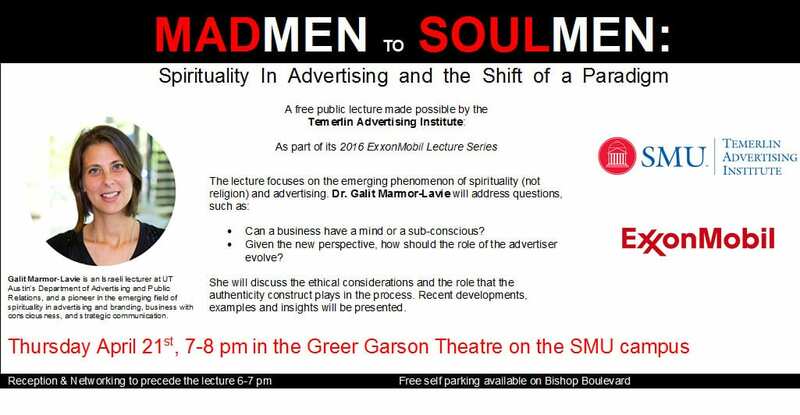 A free public lecture that brings together faculty, students, SMU alumni, and the DFW advertising community around an important marketing communication issue. Reception starts at 6 pm. Lecture begins at 7 pm. Self parking on Bishop Blvd. In February, SMU Advertising major (’16) Tien Dang was selected for the 2015 Multicultural Advertising Internship Program (MAIP). 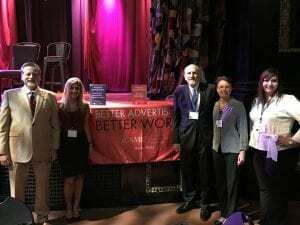 Read about her experience summer internship experience below. 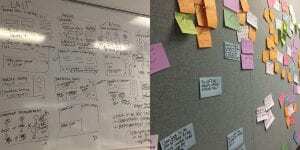 “This summer, I interned at Publicis HCG. 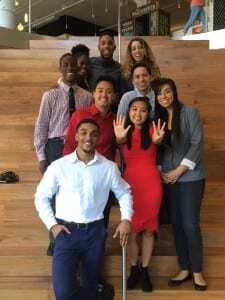 I was also a part of MAIP (Multicultural Advertising Internship Program). In simpler terms, I participated in an intensive advertising internship. From 9am-5pm, I’d work on projects at my internship. This ranged from planning social events for the office, to writing copy for clients, and even working on an unbranded depression app for the Apple Watch for our intern project. At 5pm, I’d go home to grab dinner and would continue to work from 6-10pm, sometimes even later on MAIP’s project partnering with Weiden + Kennedy on a Nike campaign. My first day in New York was a scene right out of a movie. I managed to get myself to Target via subway, but had no idea how to get back home. The Uber driver who picked me up not only offered me his mixtape and a date the following weekend, but also dropped me off no where near where I needed to be. My phone died and my friends that I somehow managed to find accidentally put me on the wrong train home. When I finally made it back, I realized that between lugging my purchases from Target around town, and grabbing dinner, I had lost my ID to get into my room. I was feeling discouraged, but was hopeful for better days to come. As the summer moved forward, I became more acquainted with the city and the people that came with it. The one thing that I loved most about interning in NYC and being apart of MAIP was that I had 80 other friends who were experiencing the same things I was. We made each other laugh, cooked dinner when someone was too busy to feed themselves, and always made it a point to keep everyone motivated. As interns and fellows, we learned to work hard and save some time to play as well. We filled our free days with visits to Coney Island, stuffing our faces with delicious food at Smorgasburg, and appreciating all of the art that NYC had to offer. The 2016 MAIP application deadline is October 30, 2015.